It converts your space movement in the air into an accurate displacement on the screen. It designed with QWERTY full keyboard that you can type fast. It will provide you with the smooth navigation and perfect control for all you needs! Air condition with this remote. Take learning "Power" key of TV remote for an example. 1.Short press TV button, the air mouse switches to infrared mode. 2.Lone press TV button for 3 seconds, the LED blinks with red, then release TV button, the LED keeps red light, the air mouse into the learning mode. 3.Keep the air mouse and TV remote infrared transmitter alignment, head to head within 2 CM. Then press the button for learning on air mouse, the red LED blinks. 4.Press the TV POWER key for about 3 seconds, the air moues'red LED will keep lighting then quick blinks 3 times, the learning succeed. 5.After learning, press TV key to exit learning mode, the red light off. This remote is works for most Smart TV, TV Box, HTPC, but it's not compatible with Amazon fire TV stick and some of Samsung TV. 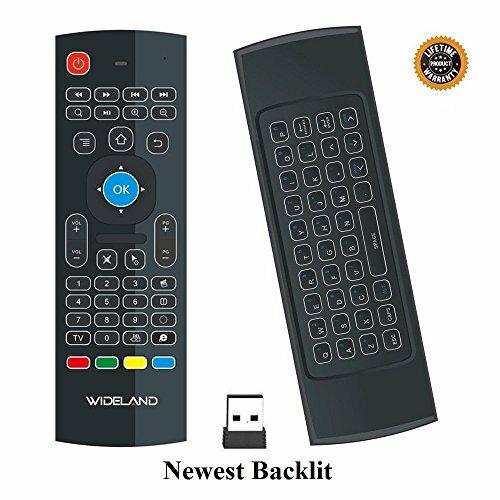 ★ LED Backlit Multifunctional Air Remote Control:Wideland Air Remote Control With led backlight buttons, you can use in the pitch-dark night easily,Wireless Mini Keyboard & IR remote & Fly Mouse Combo, with USB interface receiver. ★Control your TV:Can Learn Up To 5 Keys On Your TV IR remote,Much Easier For Your Android Smart Tv Box. If you have any questions about this product by WIDELAND, contact us by completing and submitting the form below. If you are looking for a specif part number, please include it with your message.